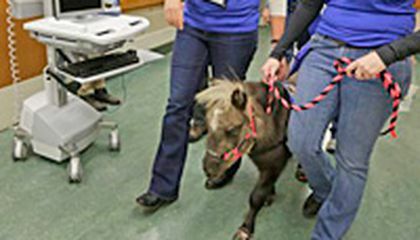 Though it may sound like one, this is no joke: Two miniature horses trotted into a hospital. Doctors and patients did double-takes when the equine visitors ambled down long corridors in the pediatric unit at Chicago's Rush University Medical Center. Wide-eyed youngsters hooked up to IV poles stepped into hallways to get a glimpse, and kids too sick to leave their rooms beamed with delight when the little long-lashed horses showed up for some bedside nuzzling. Mystery and Lunar, as small as big dogs, are equines on a medical mission to offer comfort care and distraction therapy for ailing patients. It is a role often taken on by dogs in health care settings. Animal therapy, according to studies and anecdotal reports, may benefit health, perhaps even speeding healing and recovery. Mini-horses add an extra element of delight as many kids don't know they exist outside of fairy tales. "I want one," said 14-year-old Elizabeth Duncan, stroking Mystery's nose from her propped-up hospital bed. These horses and two others belong to the animal-assisted therapy group Mane in Heaven, based in Lake in the Hills, a suburb northwest of Chicago. They have visited nursing homes and centers for the disabled, but this visit last month was their first-ever inside a hospital. It was also the first horse-therapy visit for Rush, and more are planned. "We have long had animal-assisted therapy here at Rush and just seen the enormous benefits that animals can have on most children just the joy that they bring, the unconditional love," said Robyn Hart, the hospital's director of child life services. Mini horses "are something that most people, whether kids or adults, have never seen before, and so that builds in a little more excitement and anticipation. They almost look like mythical animals, like they should have wings on," Hart said. Some people confuse these horses with better-known Shetland ponies, but minis are less stout, with a more horse-like build. The therapy they offer contrasts starkly with the austere high-tech hospital environment soft ears to scratch, fluffy manes to caress, big soulful eyes to stare into. "They're so nice and they don't judge and they're so sweet," said epilepsy patient Emily Pietsch, 17, after gently tracing Lunar's heart-shaped muzzle with her fingers. Mane in Heaven's owner, Jodie Siegel, a former obstetrics nurse, says the minis bring "smiles, joy, love and laughter and that's the true healing in action." Some research has suggested that animal-assisted therapy may reduce pain and blood pressure, and decrease fear and stress in hospitalized children. But much of it is based on patients' reports. A review of 10 years of studies about in-patient therapy using dogs, published in April in the Southern Medical Association's journal, concluded that it's safe and can be effective. Dr. Caroline Burton of Mayo Clinic in Jacksonville, Florida, a co-author of the review, owns seven dogs, four regular horses and a donkey, and strongly supports animal-assisted therapy. Burton acknowledged that skeptics dismiss it as "touchy-feely" and lacking hard evidence of any meaningful medical benefits. She said studies are needed on whether animals in hospitals can shorten patients' stays and reduce readmission rates something her hospital is looking into with dogs and heart failure patients. While some worry about animals bringing germs into hospitals, Burton's review found no associated infections in patients. Guidelines from the federal Centers for Disease Control and Prevention note that animal-assisted therapy in health care settings stems from evidence that having pets at home helps some patients recover more quickly from medical procedures. The guidelines focus mostly on infection control procedures and hand-washing for patients and hospital staff. Siegel, Mane in Heaven's owner, and her horse helpers carry lots of hand sanitizer and a pooper scooper on therapy visits. Siegel doesn't feed the horses beforehand to help avoid accidents. Even so, one of the horses pooped in a hallway during the Chicago hospital visit, but the volunteers cleaned it up in a flash and no one seemed phased. The horses were "a smashing success," Hart said. "We're looking forward to having them visit monthly." Critical thinking challenge: Why does Jodie Siegel use mini horses instead of full-size horses? Jodie Siegel uses mini horses because they look like they are fake and could be in a "fairy tale." The horses can fit in to the hospital better as well and they are easier to pet because they are smaller and less violent. They are cuter than bigger horses because they are small and cuddly and this is what the children usually pay attention to. It is a lovely thing that hospitals would do such a deed to make a patient more happy and possibly feel a bit more comfortable. If Jodie Siegel used full-size horses, they wouldn't be able to go room to room. They full-size horses would take up too much space in the hallways. Now with min horses, they can go into each room and walk around. What if the baby horse has the flu or has a sickness. What if the baby horse gits scared and goes wild. Because it can put the patients in life and death problem. I know that sometimes it's nice to just have an animal by your side instead of another person. They don't judge you and just want to be loved. I wonder if they will continue to try other animals as a resource of therapy, like cats or rabbits. One, they used mini horses because they are more cute. Two, they used mini horses because full sized horses wouldn't be able to fit in the area. Honestly I find it amazing that animals can help people in this way. I wonder if someone can make a device that works on animals and people so they can understand each other and such. That would be amazing! This is so thoughtful to bring a therapy animal into a hospital to see kids. I think that animals can cheer any one up because, who doesn't like animals. If a person in the hospital misses their pets at home this could be their comfort because who wants to be stuck in the hospital for days or even weeks. When i first started reading this article I was wondering why the therapy workers brought in a horse instead of a dog? 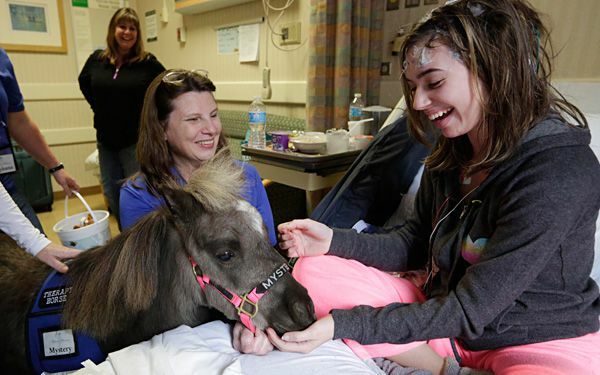 It doesn't surprise me that the miniature horses being used to bring cheer to hospital patients actually works. I think if I was in those people's situations I would love to have something come to surprise me and make me feel better. She uses mini horses because full size horses would be really hard to get in and out of a hospital. I had no idea they did this though; I just thought they used dogs. It is a good idea because some people don't like dogs so it still gives them a way to be cheered up. I'm glad to see that more and more people are finding that horses are lovable companions. I have had experience with horses, and they can be just as stress-relieveing as a dog or cat.